Posted on July 8, 2014 This might be outdated! My friend (and awesome fellow at WooThemes) Gerhard wrote a few months ago a really nice snippet to add a new column in the WordPress administration edit order page to display the order weight. 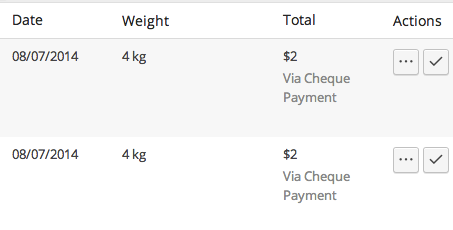 This snippet is really great but the order total weight will not be fully accurate if you change a product weight because the snippet calculates the order weight on the fly. Let’s say a user buys product A, which weight is 10 on july 15th. User A purchases this product on the same day. But a week later you get a new version of product A that is slightly less heavy. You then edit product A weight and set it to 9. Gerhard’s snippet will display user’s A order total weight equal to 9. But if you send user A product former version of product A (the one that user A purchased) the right weight is 10, not 9. Does that makes sense? But so far, I haven’t been able to get any data to the column. Do you know a way? Thanks! I created the plugin Woo Orde Weight based on the concepts of this blog post. Hi, thanks for the snippet. Is there a possibility to edit the order weight? Thanks – exactly what I wanted. How can I also add it into the order page?